San Francisco, CA - Some 500 Tibetans and Tibet supporters took to the streets of San Francisco on March 10th to mark the 53rd anniversary of Tibetan National Uprising, when thousands of Tibetans rose up against China's invasion and occupation of Tibet, defiantly resisting the repressive policies that continue today and have provoked an unprecedented wave of self-immolations by Tibetan monks, nuns and laypeople. The program began at Berkeley City Hall, with the raising of the Tibetan national flag on the city flagpole and speeches by Tibetan representatives, Berkeley Councilmember Kriss Worthington and Richmond Mayor Gayle McLaughlin. "The struggle of the people of Tibet is a basic struggle for self-determination, and I am in solidarity with that struggle. The human rights abuses by the Chinese authorities must stop. I am just learning about the rich history of Tibet and how it existed as an independent sovereign nation, for hundreds of years prior to the Chinese occupation in 1959," Mayor Mclaughlin said. "It is important that all advocates of Human Rights in the US and i might add all government officials in the US take a stand with the people of Tibet. Not only must we stand in solidarity, we must make it clear that this Chinese government is at fault for deep human rights violations and bringing detentions to this point," she said. Honorable Berkeley Council member Kriss Worthington, urged individuals to stand in solidarity with the Tibetan people. "It is time to say enough is enough," it is time to tell Hillary Clinton to sign the pledge to standupfortibet - It is time for President Obama to StandUpforTibet,"
he said. The city of Berkeley unanimously voted to pass a resolution in support of the "Tibetan peoples struggle for freedom - we stand in solidarity." Tibetans and supporters then gathered at Justin Herman Plaza, in front of the historic San Francisco Ferry Building, for a kickoff rally featuring rousing speeches, a profile of each of the self-immolators, and a graphic die-in during which protesters laid down to symbolize the millions of Tibetans who died as a direct result of the illegal Chinese occupation of Tibet. "On the 53rd anniversary of March 10th, Tibetans are still demanding independence and the freedom to be Tibetan - to speak Tibetan, to practice our Buddhist religion, to live free in our own country," Tenzin Tsedup, President of the Tibetan Association in Northern California said. "Today people around the world are in the streets standing up to say, we are with you; the Tibetan struggle is a human struggle; we stand with you until Tibet is free." The protesters then marched through the heart of downtown San Francisco along Market Street, led by a massive truck displaying a large portrait of His Holiness the 14th Dalai Lama, alongside banners and Tibetan flags, and stopping at United Nations Plaza for a die-in in front of the Federal Building. "I am marching in solidarity with the Tibetan people as they demand independence, human rights and the return of His Holiness the Dalai Lama to Tibet. I come from the Philippines, a country and people with our own history of resistance against colonizers and occupying foreign imperialist forces," Former Students for a Free Tibet US Grassrooots Director Kalaya'an Mendoza said. "This is why I stand with Tibet and the Tibetan people. It's about solidarity, not charity," he said. The crowd of hundreds then laid around the message "Enough! StandUpforTibet.org," chalked on the ground of the plaza. Simultaneously, a large airplane banner with the message "Tibet is burning, standupfortibet.org" was flying in the sky around San Francisco for an hour while protesters marched through the streets of San Francisco. "This past year, over 25 Tibetans lit their bodies on fire in the most direct rejection of Chinese rule and to call out for help from the global community," said Tashi Namgyal, President of the San Francisco Regional Tibetan Youth Congress. "As three Tibetans nearing the third week of a hunger strike waste away in front of the UN headquarters in New York, we say "ENOUGH! to Beijing's violence and call on the UN Human Rights Council to condemn China's crackdown in Tibet when they meet next week." The demonstrations continued past San Francisco City Hall to the Chinese Consulate, where a 40' balloon banner reading, "Xi Jinping: Tibet Will Be Free" was hoisted into the air by Duane Martinez, Tenzin Gyaltsen, Dorjee Tashi, Tenzin Yeshi, and Tenzin Choephel. Despite the windy conditions, the banner team was able to keep the banner facing the continuous traffic along Geary Boulevard and the Consulate building. With most of the eastbound lanes on Geary Boulevard blocked off, protesters gathered before the Consulate and listened to speakers from Amnesty International, the Chinese Democracy community, Former Tibetan Prime Minister Tenzin Tethong Namgyal. Former SFRTYC President Topden Tsering dedicated a poem to the Tibetans in Tibet. "Off we go, O brothers and sisters, to our lives bidding farewell, giving up our bodies; in your hands, now leaving: our sacred ravaged land, our one fatherland," he said. The official statements from the Tibetan Government in Exile and Tibetan Youth Congress were read by TANC Vice President Tenzin Palzom and SFRTYC President Tashi Wangden. In a climactic end to the protest at the Consulate, Chinese-Human rights activist Albert Chan made demands to the Chinese government to stop its rule over Tibet while burning the Chinese national flag which he said represents lies, torture, human rights violations, tough re-education programs that resulted in the death of millions of Tibetans in their struggle for a Free Tibet. Protestors gathered in the evening at Union Square, in the heart of San Francisco's tourist and shopping district, for a candlelight vigil and freedom concert, featuring statements of support from representatives of the offices of Senator Nancy Pelosi and Representative Jackie Speier and a speech by Chinese Democracy activist Fang Zheng, who tragically lost both of his legs at the 1989 Tiananmen Square protests. Representatives of the Tibetan Assocation of Northern California, San Francisco Tibetan Youth Congress, Students for a Free Tibet, and Bay Area Friends of Tibet also spoke on the significance of March 10th, the self-immolations and current situation in Tibet, and how supporters could get involved by petitioning the United Nations to intervene by sending an official fact-finding mission to Tibet. "For over 53 years Tibetans have repeatedly and clearly rejected the state of total control imposed by Chinese authorities. The Tibetan people are extremely committed more than ever to leaving their own personal fears behind as they resist the Chinese government's oppresive and illegal occupation. We call on China to stop the war against the Tibetan people, allow unfettered media access in Tibetan areas, and withdraw its military forces from Tibet." said Giovanni Vassallo, president of Bay Area Friends of Tibet. Bay Area Students for a Free Tibet then emphasized on the current non-violent resistance happening all across Tibet and discussed the Tibetan nomads right campaign. They pointed out the victories of Tibetan Villagers who had successfully halted a controversial mining operation that threatened Ka-wa-ghebo, one of the most sacred peaks in the Tibetan world by throwing $300,000 worth of mining equipment into the river, and the Lhakar movement, where Tibetans are protecting their language, culture, tradition and identity by eating Tibetan food, wearing the traditional Tibetan chupa, and eating only Tibetan food to support their Tibetan community. "These are actions Tibetans in Tibet have taken on a grassroots level through non-violence means to resist the illegal Chinese occupation of Tibet. In the past year, Egyptians, Tunesian, Libyans, Syrians, and people around the world have risen up and shown that time is up for dictators," said Tenzin Tselha, Member of UC Berkeley Students for a Free Tibet. "Through the self-immolations, the protests, the acts of civil disobedience, Tibetans are also saying that one more day under the Chinese regime is too long - we want to be free now, it is our right to be free now and it is not a matter of if but of when for Tibet." State and local representatives released statements on this day to commemorate the many Tibetan lives lost in their struggle for freedom. "We pray for and end to Chinese rule and the imprisonment of Tibetans who are barred from the free practice of their faith. No regime, no government can break the bond between the Dalai Lama and the Tibetan people," United States Congresswoman Jackie Speier said in her statement. 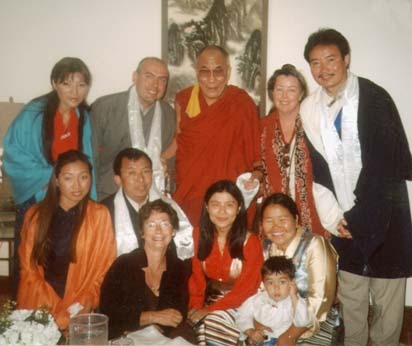 "On this anniversary, we call on the Chinese government to cease its religious repression, allow access to the region by journalists and international observers, and release Tibetan political prisoners, including the 11th Panchen Lama, Gedun Choekyi Nyima who was kidnapped as a young bo,"
said Democratic Leader Nancy Pelosi in her statement of support. 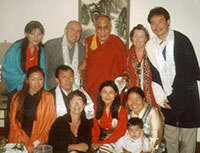 "The cause of Tibet continues to be a challenge to the conscience of the world. We must heed the guidance of His Holiness the Dalai Lama, and we must not forget the people of Tibet and their ongoing struggle." The demonstrations were organized by San Francisco Team Tibet, a coalition of organizations advocating for Tibet: Tibetan Association of Northern California, San Francisco Regional Tibetan Youth Congress, Bay Area Students for a Free Tibet, and Bay Area Friends of Tibet.